I have a 49DS that has developed a few leaks. Has anyone dismantled the cabin wordwork to gain access to various locations where water could intrude from deck hardware ? Just purchased a 2006 49DS Just curious where you find the water in the boat? I have some entering in the Starboard side book shelf, but only when it rains very hard. I have a 2007 49 DS. 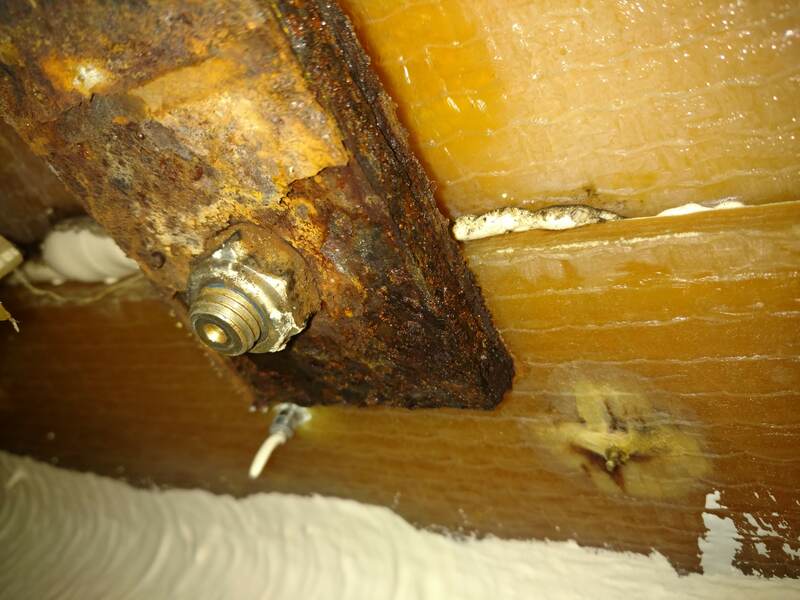 Experienced leaks above the starboard side bookshelf during heavy rains. Discovered the source was the large cats eye window caulk. One of the guys that occasionally works on the boat did the resealing job without removing the window. That was a year ago and no leaks since. The stanchions bases can leak , it would be worth checking the backing plate underneath if there is any sign of rust then rebedding them , there may be a timber covering panel under a few of them for access . Purchased my 2006 49DS a few months ago. I just started the project of pulling out stanchions to rebed and put on a new back plates. I have 4 that I know i need to do. This is what a rusty back plate looks like... They are probably sealed with 5200 which makes it a real pain to get the stanchion out. Recommend "Marine Formula by Debond Corp"